Takeout-style sesame noodles with cucumber. I saw this posted on Tuesday, didn’t have a firm plan for dinner that night, and had all the ingredients for this in the pantry, plus cucumbers in the garden and it was the greatest. 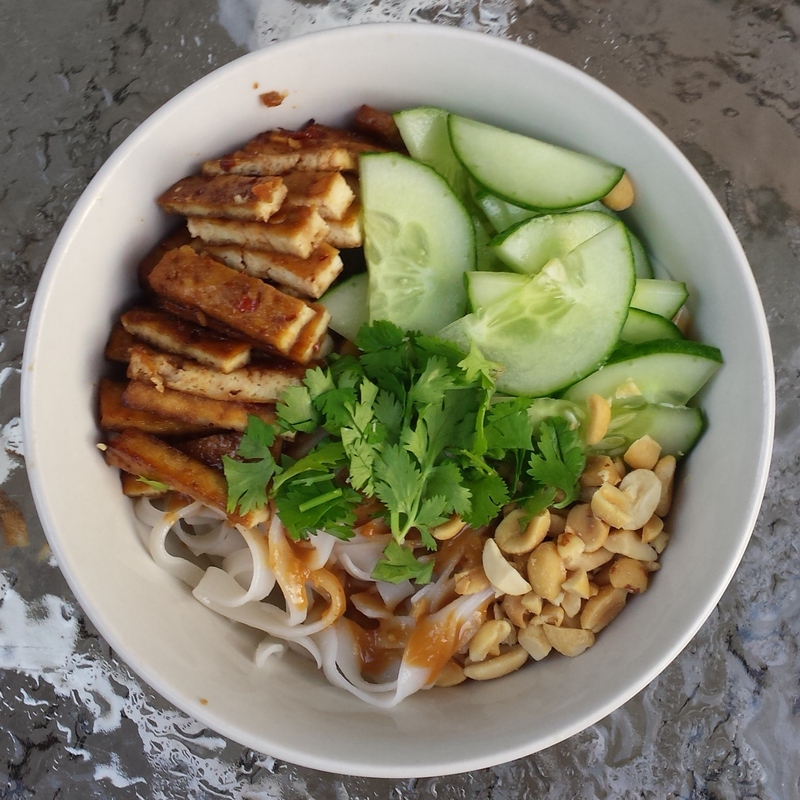 I’ve had trouble cooking rice noodles, but I watched these like a hawk and then drizzled them with sesame oil as instructed, and they didn’t turn out gummy or all stick together (hallelujah!). I always love a nutty, creamy, slightly sour sauce like this (which tastes strong on its own but mellows nicely with the noodles). After running around all day I knew I would need a more substantial meal, so I roasted some tofu a la Thug Kitchen (page 77 of the cookbook….that’s how often I use this method). Because of the tofu addition I served the noodles still warm and they were everything I hoped for. 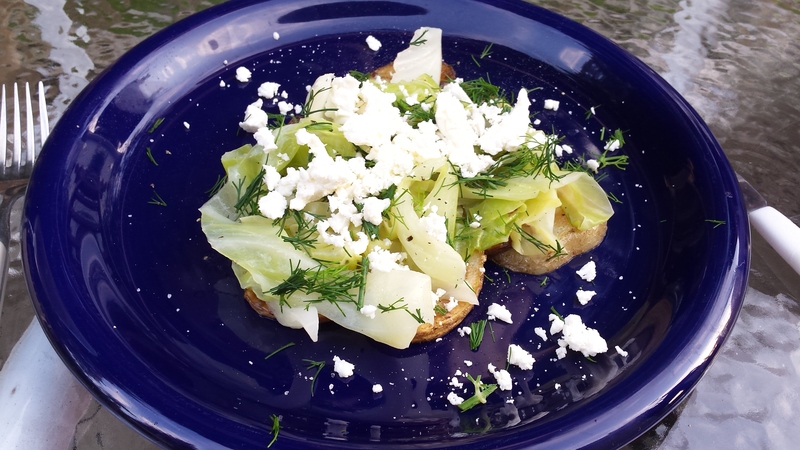 Braised cabbage with fried potatoes, feta, and dill (from Vegetable Literacy). Very fancy feeling. The creamy fried potatoes were nicely balanced with wilted buttery cabbage, salty feta and herbal dill (which I don’t cook with enough). This would have made an excellent course at an Irish mid-summer farm dinner. Unfortunately I made just this for dinner, and Madison’s serves 4 definitely meant as a side not a meal. Corn bread salad. I have to admit this did not turn out, but it was entirely my fault as I let the cornbread go south (I thought toasting it up again would save it…I was wrong). Even if I had done everything according to recipe, it probably would not be my favorite dish. I already don’t like croutons in salad, and then getting them all soggy just makes everything that much worse. But I tried it, and I think most people without soggy crouton aversions would like this, so have at it. Zucchini ricotta fritters. 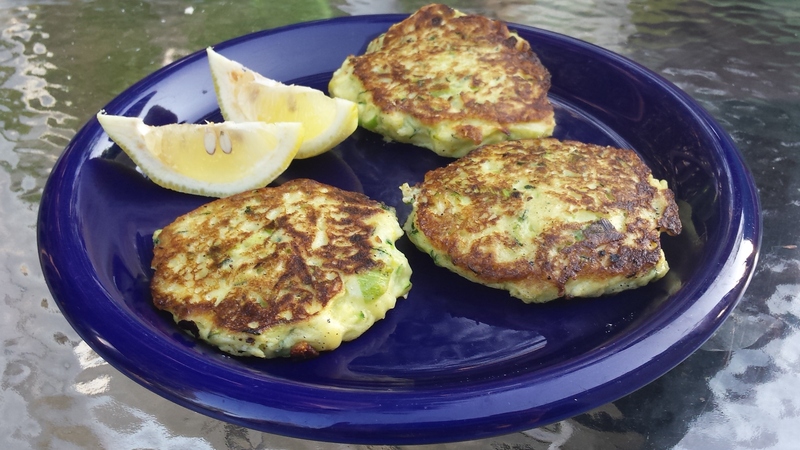 I’ve been on the hunt for the best zucchini fritters for a while now…and these still aren’t quite them. 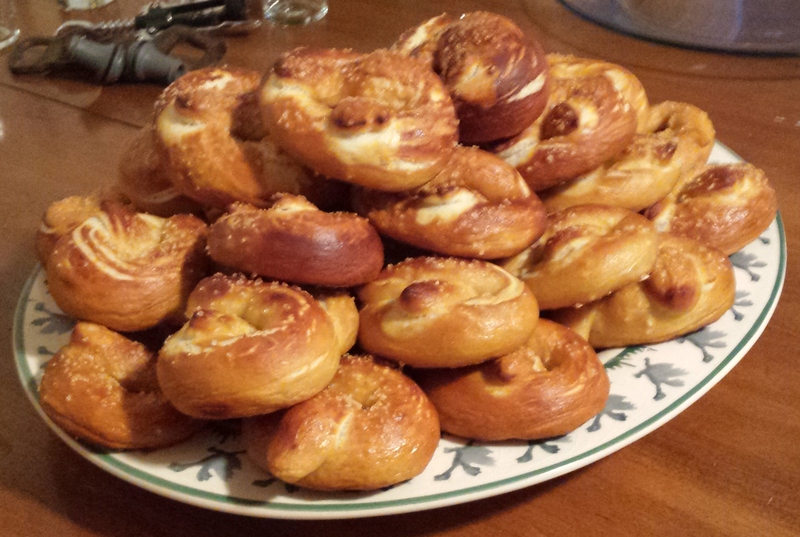 The ricotta made them super moist, but to the point of being hard to cook through. They stayed together really nicely, browned quickly, and then sat in the oven for a bit and still were super soft in the middle. Most zest and more salt next time, higher heat, and longer in the oven. 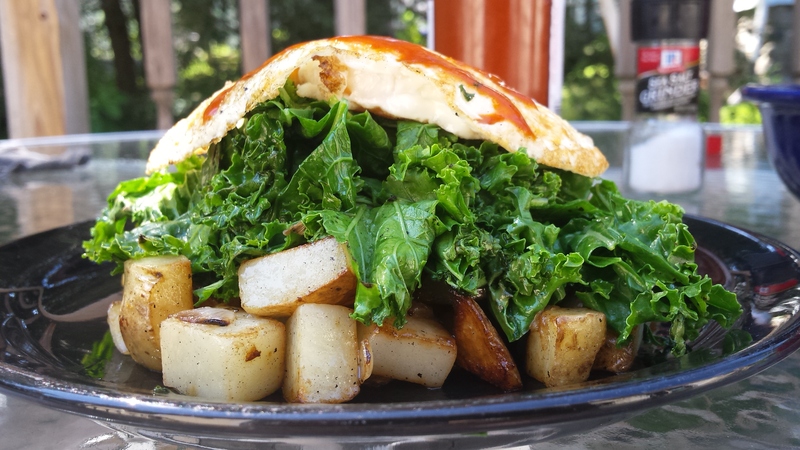 Potatoes with kale and a fried egg. This remains one of my absolute favorite breakfasts. This time I cooked the potatoes cubed in the cast iron, and added some diced onion halfway through cooking. The potatoes aren’t quite as decadent that way, but they do cook faster. 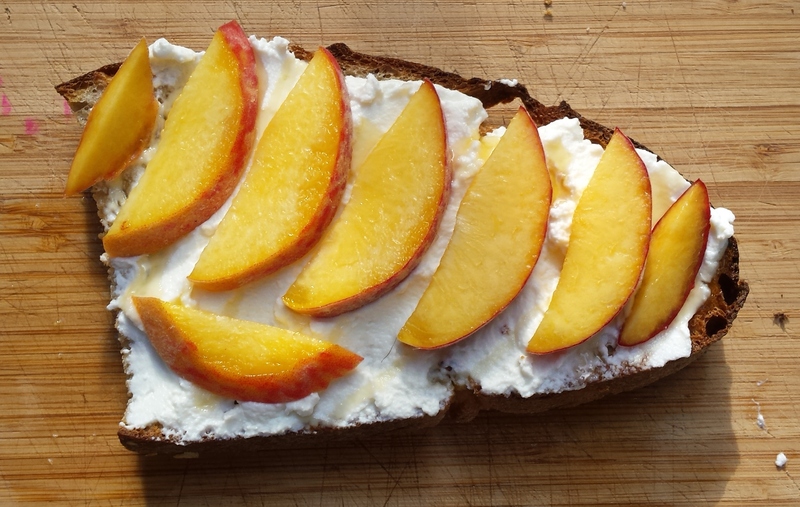 Toast with ricotta, honey, and peaches. My favorite breakfast, lunch, and coffee spot in Worcester is also a bakery, and most of their breakfast menu is just their incredible breads toasted with various spreads (like country bread with homemade raspberry jam, and olive and herb bread with whipped feta and olive oil). After eating there Sunday I wanted nothing but toast for breakfast all week, and did different renditions of ricotta with jam or honey and fruit. Without at all meaning to, I created a signature breakfast. It started out with a latke phase a few months back, but then I realized that not trying to get everything to stick together and just calling them hash browns was far easier (plus, more crispy bits that way). What resulted has become a weekend regular around these parts: crispy, earthy potatoes, barely cooked kale, and a rich egg on top (best cut with hot sauce, if you ask me). The ingredient list is simple, but the potatoes take a bit of time to cook. The kale and eggs come together quickly after they are done. 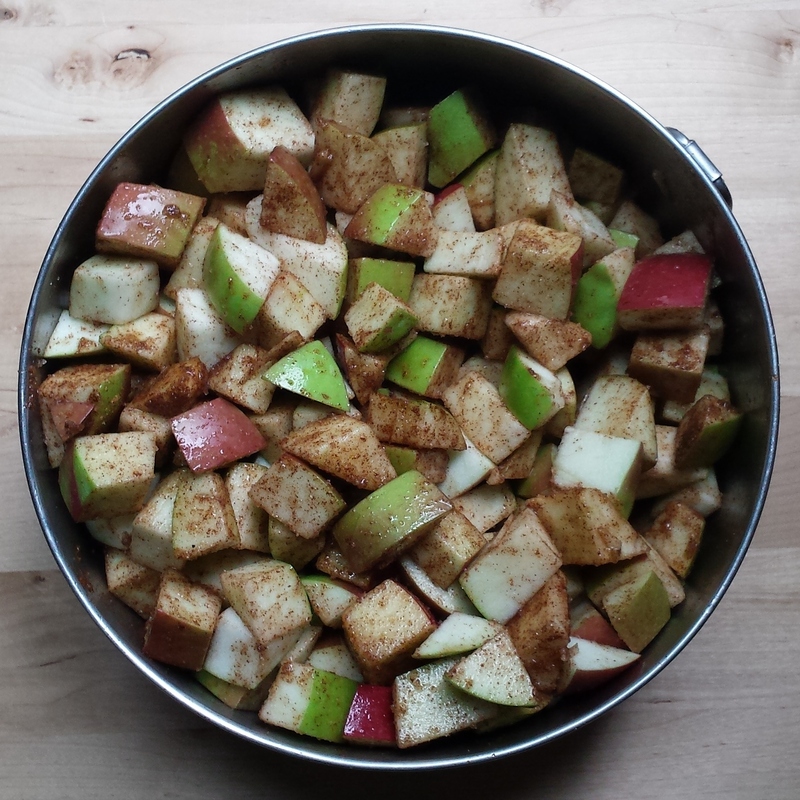 You could try doing things in more than one pan to speed up the process, but I usually make this as a lazy weekend breakfast when time is more plentiful and I can listen to a podcast while putzing around the kitchen (usually Gastropod or Startalk). Use any greens in place of kale, but I think more bitter greens go best with the potatoes. Grate the potato and onion on the largest holed side of a box grater or in a food processor. Put both in a towel and wring out as much liquid as you can. Leave them in the towel for a couple minutes, and then wring again. Mix together so the onion is evenly distributed in the potatoes. Melt the butter with 1 tablespoon olive oil in a big pan (cast iron if you have it) over medium heat. Add the potatoes and onions in a ½” layer (in my 10” cast iron I usually do them in 2 batches, and add a bit more butter and oil to the pan the second time around). Season with salt and pepper. Cook them uncovered for 10-15 minutes, while stirring every 4-5 minutes. The hash browns should be mottled golden to light brown. If they are blackening quickly and still seeming raw in the middle, the pan is too dry (add some more butter, oil, or both). When all the potatoes and onions are cooked, remove from the pan and cover to keep warm. Add the remaining tablespoon of olive oil to the pan, and let it heat for a minute. Add the chopped kale and stir to coat in the oil. Sprinkle with salt and place a lid over the pan, and let the kale cook for 1-2 minutes (stay by the pan!). The kale should look shiny, moist, and very bright green all over. If the kale starts to yellow in spots and is not uniformly bright green, it’s starting to overcook (still very edible, just not the best). Serve topped with an egg cooked to your preference. I do them over easy, cooking for 3-4 minutes on medium high heat until the whites are mostly set, turning off the heat, flipping, and removing from the pan after another minute. Hot sauce on top encouraged. 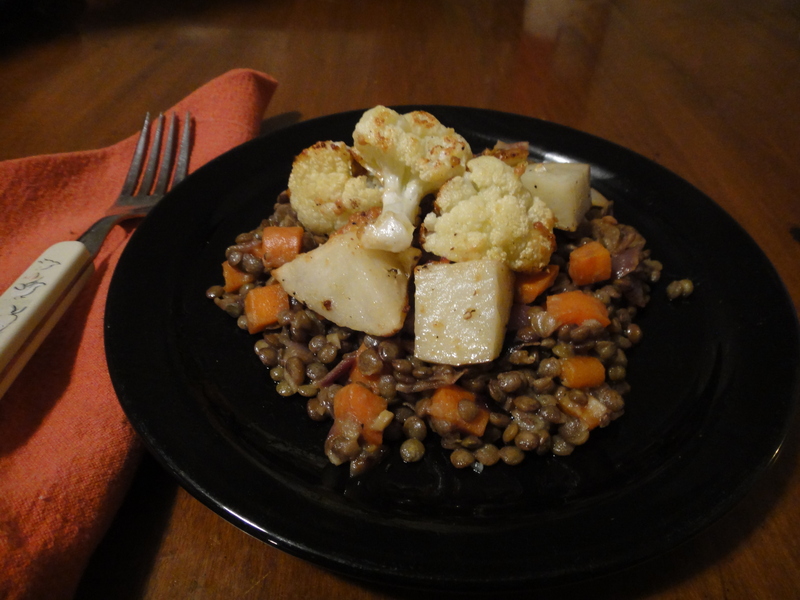 This French lentil recipe by Ina Garten was my first introduction to cooking lentils. I’ve made it many times since that first delicious occurrence, but with quite a few changes. I find that the dressing adds enough flavor to the lentils that cooking them with a turnip that is discarded is unnecessary. Her quantity made just enough for 4 small meals, but I always wanted a little more and leftovers. I’ve made the lentils with roasted sausages, which could be in place of or with the cauliflower and potatoes. Some toasted bread with olive oil alongside is also quite nice, as would be a green salad. Serves 8 as a side, 6 as a meal. Preheat the oven to 425F. Mix the whole grain mustard and 2 tablespoons of olive oil. Toss cauliflower and potatoes in mustard olive oil mixture plus salt and pepper. Spread on a baking sheet and roast for 25 minutes. Pick over the lentils for debris and rinse. Bring a pot with the lentils generously covered in water to a boil and simmer, uncovered, for 20 minutes. Heat a large skillet with the remaining 2 tablespoons of olive oil over medium heat. Add the carrots and saute for 5 minutes, until they just start to soften. Add the onion, and saute for another 5 minutes until both are soft. Add the garlic, and saute for a minute or 2 more then turn off the heat. While the carrot and onion are cooking whisk together the ½ cup of olive oil, Dijon mustard, red wine vinegar, salt and pepper. In a large bowl mix the sauteed carrot and onion, Dijon dressing, and lentils. 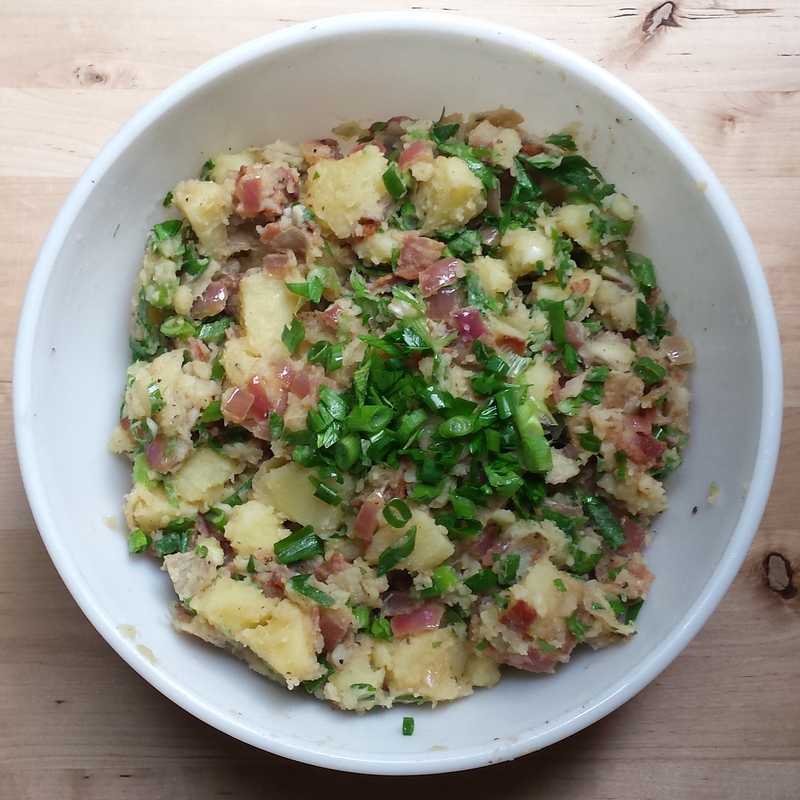 Serve with the roasted cauliflower and potatoes on top, with extra vinegar if needed.